Having presented its inaugural concert in 2017 to high critical acclaim, the Western Orchestra of Ananda College will proudly present it’s annual concert, “Dolce'19” on April 6 from 7pm onwards at the Bishops College Auditorium, Colombo 3. The Chief Guest for the event will be Prof. Kolitha Bhanu Dissanayake, former dean of the Faculty of Music. The Guests of Honour would be Major General M. N. S. Perera (Director, National Cadet Corps), Major General Vajira Wijerathna (former Director General National Cadet Corps) and old Anandians Harsha Makalanda (composer and pianist), Dr. Sunil Perera (Consultant Neurosurgeon) and Prof. Anul Perera (Professor-University of Moratuwa). The Orchestra was formed six years ago under the vision and guidance of the master in charge, Maj. Nishantha Gunasekara. The Orchestra participated in the All Island Orchestra Competition organized by the Ministry of Education for the very first time in 2016 and also took part in 2017 and 2018. The orchestra emerged Runners-Up in all three years. The orchestra regularly performs at college functions and has performed at “Vivace” concerts organized by the Western Music Association of Ananda college in 2014, 2015 and 2016. 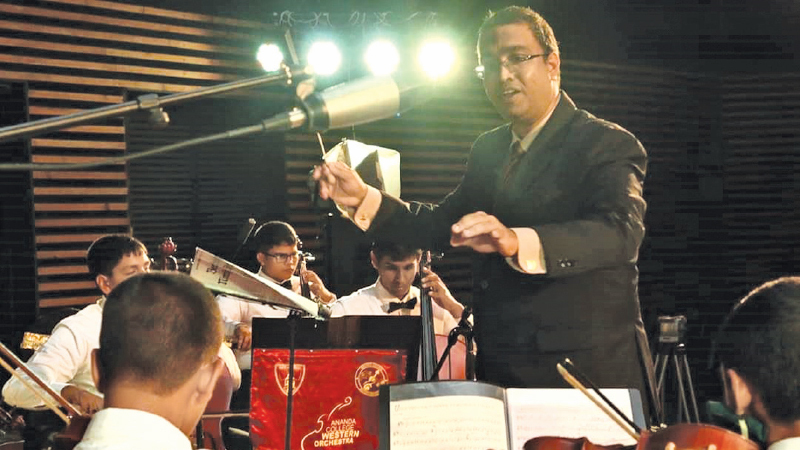 The orchestra also performed as part of the combined orchestra which comprised of the orchestras of Ladies' College, Ananda College and the Band of Gateway College, Rajagiriya at “Mozzafiato” in 2018, which was hosted by Ladies' College. In October 2018 the orchestra was also invited for a guest performance at “ConBrilliante” organized by the Orchestra of Lyceum International School Nugegoda. Many members of the orchestra of Ananda College are also members of the National Youth Orchestra of Sri Lanka and many other notable orchestras in the country. The orchestra brings in seven instructors and trains and enters students for exams conducted by the Associated Board of the Royal Schools of Music (ABRSM) in London every year. Most of the members of the orchestra are qualified by this exam board. The conductors for the night will be Dr. Dilan Angunawela, Maj. Nishantha Gunasekara, Uthsara MalaweeraArachchi, Agraja Wijayawardana, Thaveesha Paranawidana and Ninura Gunasekara. The Junior orchestra will be conducted by Jayana Gunasekara. The concert will also mark the first public performance by the orchestra with the newly acquired Timpani and two double basses. The Timpani was generously gifted to the orchestra by the financial support of some parents of the members of the orchestra. The concert will feature a wide array of music from different periods and genres. The programme will feature works from renowned composers such as Franz Lehar, Johann Strauss etc and will also have pop music such as Final Countdown and music from major movie tracks like “Avengers” and “Pirates of the Caribbean”. The concert will mark the first performance of the College Anthem by a Western Orchestra. The arrangement for orchestra is by Old Anandian Sachiththa Fernando. The Choir of Sri Sumangala Girls School Panadura will join the Western Orchestra of Ananda College in some choral items. Tickets are available at the Sarasavi Bookshop Nugegoda, Sadeepa Bookshop Borella, Godage Bookshop Maradana and with members of the Orchestra.